I thought it's about time I got a little festive for the 4th of July! It seems with every relocation, I lose a little more of my patriotic decor. We're often traveling that week, so I rarely have opportunity for red, white and blue themed entertaining anyway. 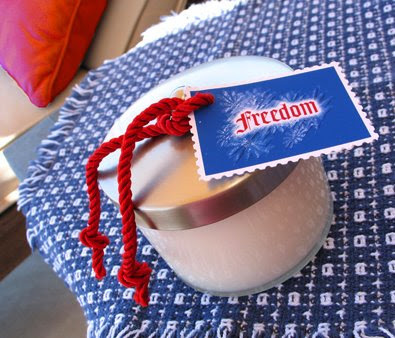 But I did find a little American flag that I nestled into a reed diffuser; and added a red satin ribbon accent: And pulled out this neat red silk cording: I made a little "Freedom" tag, and with the cording, embellished a cute candle jar. Independence Day is one week from today! Let's celebrate our country's unique heritage. NOTE: I just added 5 x 7 print sizes of my art in my Etsy store. And the day after Independence Day, A wish for a Happy Birthday. Missed being a fire cracker but you have fire and spark in you. Hi Jeanne! I believe it was you that I read about in the ORU publication this month...forgive me if I'm mistaken...but I thought it was you! I too am a ORU student with 3 kids there this fall! Loved the article and your inspiring words and items you make. I thought it was wonderful! 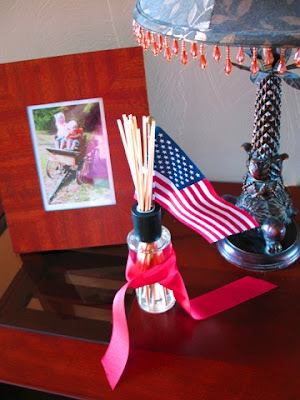 I don't do much decorating for the 4th and so I really like those little, easy touches.